Thirteen years have passed since Peter’s first ‘greatest hits’ compilation Shaking The Tree appeared. It had a well-chosen selection of tracks, there was nothing to complain about it and a new album was about to be released, too. The situation is similar in 2003. Eighteen months ago Peter promised that a new album would be released. It was to be called IO and was allegedly almost completed. What followed was an extensive tour, numerous interviews in which he mentioned even more different album titles and ideas for new project, the Growing Up Live DVD, even his collaboration on a fantasy game for PC, an almost finished songwriters’ version of OVO and the announcement of a new soundtrack project. Now there is HIT. 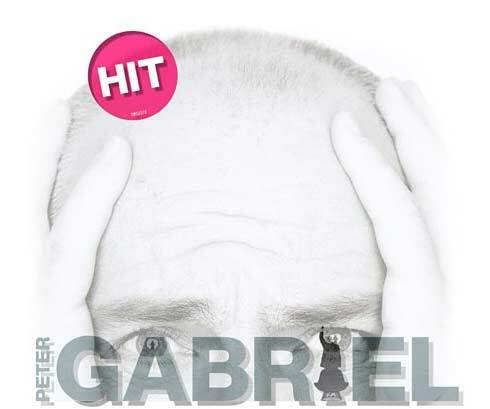 Peter Gabriel is and will remain the master of getting distracted. This CD is identical in all versions of HIT. Solsbury Hill was a terrific debut hit in 1977. It entered the UK Top 20 and ranked higher than Genesis at the time (which wasn’t difficult). Shock The Monkey was quite a hit, too. Sledgehammer became an über-hit, it made it to the #1 spot in the United states. Three songs, three hits so far. Don’t Give Up is famous but was not that big a hit. The version included is the 1990 version without the fade-in. Games Without Frontiers was Peter’s first UK top 10 hit so that rightly claims a place on CD1. No explanation was given as to why the song begins halfway through the intro. Big Time enjoyed massive airplay and was a major HIT in the wake of Sledgehammer. Burn You Up, Burn You Down is a new song, but it isn’t, really. A different version of it can be found on the Up promo CD. On HIT it is less radio-compatible and one would not expect this to be a hit! There are no plans to release it as a single in Germany. Paradoxically, this “dirty” version would have been very fitting for Up. Growing Up lay in the record stores like lead. The single release for the UK was cancelled. Great hit. Interestingly enough, it was the video version, not the single version that was included on HIT. Digging In The Dirt was a middle-sized hit. Blood Of Eden wasn’t. More Than This stormed up the charts to a glorious #47 in the UK charts – in the week after Christmas when everybody rushes out to buy new singles. Marvellous hit! It’s another radio edit to boot, just like Blood Of Eden. Biko definitely is a hit, less because of its position in the charts and more because of its position in political rock music. Steam was a big hit, that’s why the single version is included here. Red Rain was not a big hit, but it’s a great song. Here Comes The Flood has never been a hit – we hear the 1990 piano version. Sounds like a hit! Would-be hits are mixed with middle-sized and major hits on CD1. You can sing along to them all. It’s almost like a hit-parade (those kinds of things feature total flops, too). There are three different versions of this CD. It’s great fun buying all of them, especially since the differences are not all that big. There is an international version and there are special editions for the U.S. and Germany. Can Miss Hit live up to the expectations? San Jacinto – no question! It’s a must on Miss. No Self-Control is another classic, but not a hit. Cloudless is a gem on the Long Walk Home soundtrack featuring the fantastic Blind Boys Of Alabama. It even is a radio edit, but it has earned a place on MISS. The Rhythm Of The Heat is one of Gabriel’s ultimate songs. Perfect! I Have The Touch is the first surprise. MISS features not the 1986 remix, but the 1995 version with Robbie Robertson and additional lyrics. It’s a great version and a good choice! I Grieve was basically not new on Up, but in a different, more intense mix which can be found here, too. D.I.Y is the only track off the second album, and it really MISSed the charts. If one read MISS as “Miss the charts” this were one of few songs that were not out of place on this CD. A Different Drum had not stood any chance had it been released as a single. Still, it’s a huge favourite with the fans. The Drop is rumoured to have a video, too, but no one has seen it yet. It was no single and never will be one, but it’s a terrific song nevertheless! The version of The Tower That Ate People that was included here comes from the Red Planet soundtrack. The movie was abysmal, but the song is very convincing. Lovetown was released as a single, but in this case the film was better than the song. Philadelphia was one of the milestones of the 90s, and Lovetown is just a small but precious part of it. Father, Son (from Ovo) was the fitting ending of the Growing Up tour shows. This, however, is the studio version. Signal To Noise is another monument in Gabriel’s oeuvre. This song premièred in 1996. Before it was released on Up in 2002, Gabriel’s co-vocalist on this song, Nusrat Fateh Ali Khan, passed away, which gave this song an almost grotesque popularity. Downside Up is a song Peter had not sung on the original release, so we are happy that this great number is featured as the live version. Washing Of The Water is a peculiar choice for the last track of the international version. The German MISS adds the following songs: Du Bist Nicht Wie Wir (from his first German album) replaces No Self-Control. Kon Takt! regrettably replaces the new version of I Have The Touch. Both D.I.Y. and A Different Drum have to make way for Handauflegen. The German version of Family Snapshot, Schnappschuss (Ein Familienfoto) replaces Washing Of The Water and makes for a better ending of the CD. The U.S. version finishes with Cloudless. One also finds In Your Eyes, the song that has been played to death on too many concerts in recent years. I Don’t Remember replaces No Self-Control. D.I.Y. and A Different Drum give way to Family Snapshot and Love To Be Loved. Got that? Oh, and all CDs feature an interactive version of The Tower That Ate People which didn’t work at the time this review was written. A particular highlight at the end: What is the German translation of Burn You Up, Burn You Down? It apparently is Dich Niederbrennen, Dich Zur Weissglut Bringen! [literally: to burn you down, to make you see red; translator’s note] That’s what it says on the back cover of the German version. Yessir, all song titles were translated. One had to fear the worst. Image the first lines of Erwachsen Werden (Growing Up) in German: “folded in your fleshy purse” – actually, better don’t. Luckily enough, we were spared. Only the four songs mentioned above were sung in German. The record company has admitted to have fouled up. It was an accident that all titles were translated. Well, almost all titles. Solsbury Hill did not become Solsbury Berg. But a title like Signal An Den Lärm [literally: a signal directed at the noise; translator’s note] is embarrassing. Well, this flawed version is being replaced, but it still can be found in shops. Once again, the confusion is complete. What is this all supposed to be about? A box set or a release of Odds and Sods would have pleased the fans better – and the single CD version would have been quite sufficient for the mainstream market. Come Talk To Me and Mercy Street are glaring omissions. The first Up single, The Barry Williams Show was not included and neither was Shaking The Tree. The second album is underrepresented as usual. A compilation of video clips on DVD is not planned, either. This release sometimes hits the bullseye, often it misses by far. HIT and MISS. A peculiar distribution across the CDs, though.